Dougherty begins with a useful introduction of the important leaders, both from the Union Navy and the fledgling Confederate Navy. These brief bios serve as a good background before the author begins discussing the mission and membership of the Navy Board, and its outcomes and specific plans. He then examines the early operations on the Atlantic Coast, with Northern morale-boosting victories at such places as Hatteras Island and in Florida. Each chapter is a general synopsis of a single engagement, such as Port Royal, Norfolk (in the context of the Peninsula Campaign), Fort Pulaski, New Orleans, etc. 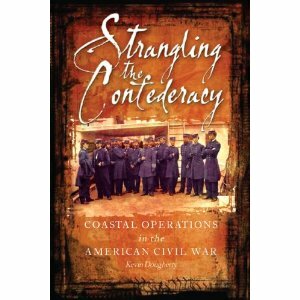 Dougherty examines the officership, tactics, ships and forces involved, Confederate defenses, political and strategic impact, and operational results for each battle. It is a very useful overview that will serve as a solid background for those readers who may wish to study the particular battle in more depth using some of the resources the author provides in his bibliography (which could have been more extensive, but is of value anyway). Maps are provided for most of the engagement, and they offer a useful geography lesson for those readers who may not be familiar with the coastline of the old Confederacy or specific locations near major cities targeted by the U.S. Navy. These show the key towns, rivers, inlets/bays, Rebel forts, railroads, etc. that were of significance to the military planners on both sides of the conflict. The book will retail for $32.95 in hard cover, but is currently on pre-sale on amazon.com at the deep discount price of only $21.75, a bargain for the quality of the contents. Civil War naval wargamers will find some useful material to plan scenarios for coastal warfare, as well as amphibious landings and joint operations.